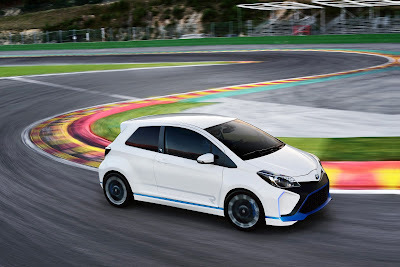 Toyota has transformed the volume-selling Yaris hatch into a dynamic track or road car by injecting it with high-performance engineering and advanced hybrid technology inspired by the company's Le Mans racing program. The Yaris Hybrid-R, which will make its world premiere at next week's Frankfurt Motor Show, is a showcase of ideas for the future development of hybrid technology to achieve maximum performance and increased driving pleasure.The concept car's hybrid powertrain combines a highly tuned 1.6-litre four-cylinder turbo engine and two powerful electric motors to provide total output of 313kW (420hp). The direct-injection turbo, which has been adapted to racing conditions, provides 224kW (300hp) of power and 420Nm of torque to drive the front wheels. 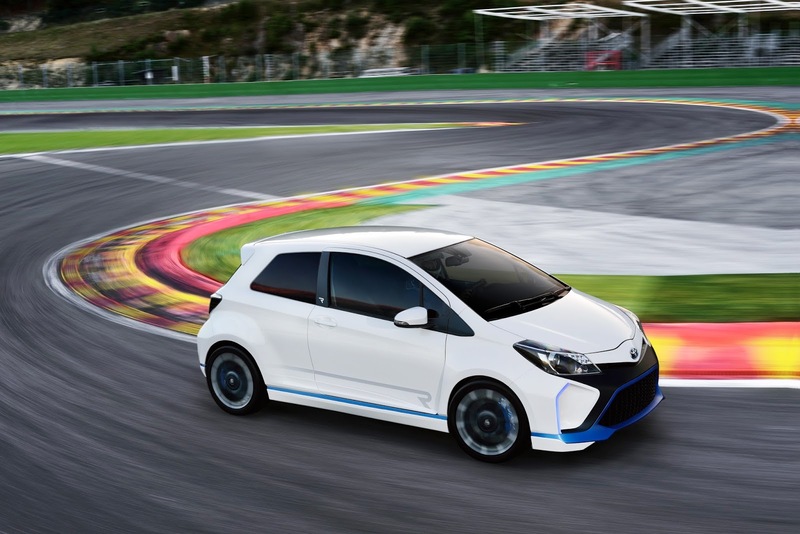 At the rear of the Yaris Hybrid-R, each wheel is powered by a 45kW (60hp) electric motor, providing an "intelligent" electric four-wheel drive capability. The motors generate electricity during braking and supplement the petrol engine during acceleration. As with Toyota's TS030 hybrid Le Mans race car, the energy recovered from braking is stored in a super capacitor. Its high power density and fast charge/discharge speed are perfectly suited to the requirements of sporty driving on a track, which requires brief and immediate bursts of power. The Yaris Hybrid-R driver can push a button on the steering wheel to select "road" mode for day-to-day driving or "track" mode for competition. "Track" mode makes full use of available performance, with the rear electric motors able to reach a combined maximum power peak of 90kW (120 hp) for up to five seconds.A third 45kW electric motor, located between the engine and the six-gear sequential transmission, can operate as an advanced traction-control system. At low speeds, or in a curve, when the engine power and torque exceed the grip potential of the front wheels, the motor can convert torque from the petrol engine into electric energy and direct it to the rear wheels.The twin rear electric motors can also enhance handling characteristics during cornering by altering the distribution of torque between the left and right rear wheels, achieving the same effect as an intelligent torque vectoring differential. Depending on the radius of the curve, the system can send more torque to the outside rear wheel, apply more braking force to the inside wheel or even brake and accelerate each wheel independently to promote a better driving line and to limit understeer. Selecting "road" mode reduces engine output and the amount of energy distributed by the super capacitor. The hybrid system works seamlessly with the 1.6-litre turbo, especially during start-up phase at low rpm when the engine's efficiency is not yet optimum. The super capacitor can release the energy recovered under braking for a maximum duration of 10 seconds, while the total power of the two electric motors is limited to 30kW (40hp). Depending on the state of charge of the battery, the Yaris Hybrid-R can be operated in full electric mode for short distances, especially during parking operations. The Toyota press conference at the Frankfurt Motor Show will take place in Hall 8, Stand D19, at 12:45pm (20:45pm AEST) on Tuesday 10 September.